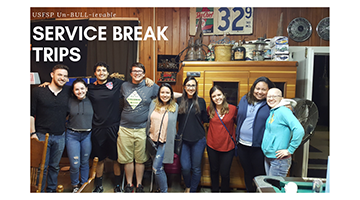 Help students attend an Un-BULL-ievable Service Break Trip hosted by the Leadership and Student Organizations Office at USFSP. HerdFunder is the USF System’s crowdfunding platform. Through HerdFunder, the USF System seeks to work in tandem with our students, alumni, faculty and staff to raise awareness and funds in support of innovative and meaningful work being done within our System every day. HerdFunder gives us the opportunity to showcase various initiatives and needs throughout the USF System in a manner that generates excitement and encourages philanthropic support. By visiting HerdFunder, one is able to learn about and support a variety of diverse projects. Each gift, regardless of size, can have a tremendous impact when grouped with others gifts from people who share your same passion. » How is HerdFunder different from other crowdfunding platforms? All funds raised through HerdFunder will directly benefit USF’s programs and organizations, less credit card processing fees. » How do I participate as a donor? By visiting HerdFunder, you are able to learn more about various campaigns and initiatives within the USF System. Once you determine the project(s) you would like to support, simply select your gift level and complete the secure online giving process. Make sure you spread the word about your support and encourage others to get involved as well. We have implemented email and social media sharing options to make this easy to do. » Where does my gift go? Your gift will directly benefit the project you choose to support. The project team will have access to every penny of what is raised less credit card processing fees noted above. » What happens if a project doesn’t reach its goal? This is one of the ways HerdFunder is different (and we think much better!) than other crowdfunding platforms. All gifts are processed directly by the USF Foundation and are made available in the fund attributed to each project, even if the goal is not achieved. Your gift makes an impact regardless! » Is my gift tax deductible? Your gift is considered a charitable gift to the USF Foundation, designated for the project you have chosen to support. A tax receipt will be provided at the end of your transaction. You may be entitled to a charitable income tax deduction for your gift since the USF Foundation is a 501 (c)(3) non-profit organization. Please consult your tax advisor for advice regarding your specific tax situation. » When will my credit card be charged? » How do I submit a project for HerdFunder? Please download and complete the application here, or you can complete the online application here. The Office of Annual Giving will review your submission and follow-up with you within two weeks. » My question is not frequently asked. Whom do I contact to get an answer? Start with Amanda Phillips, Director of Development for Annual Giving. Amanda can be reached directly at APhillips(at)usf.edu or 813-974-5908. If she can’t answer your question immediately, she will find the person who can.